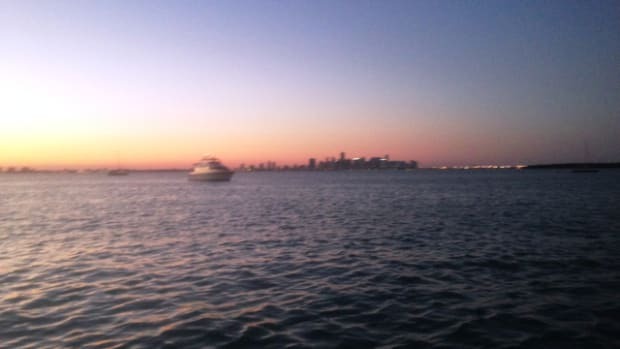 When the taxi dropped us off at Marinatown Marina in beautiful North Fort Myers, Florida, I knew this was going to be one of those "perks of the job." I looked around and saw sunbaked liveaboards lounging on the dock, enjoying a happy hour cocktail, laughing and telling stories, their Sperrys propped on deck chairs. At the time, I was PMM&apos;s editorial assistant and had been sent to Southwest Florida Yachts with our art director, Lauren Petralia, to expand my knowledge of the cruising-under-power niche by taking an introductory powerboating course. What I came away with was a better understanding of what the cruising life is all about: a true sense of community, the joys of living simply, and an appreciation for experiences and relationships that make life worth living. I wasn&apos;t completely new to boating. I was raised cruising Chesapeake Bay with my family on our 25-foot cabin cruiser. I obtained my Maryland recreational boater&apos;s license when I was in high school, and in more recent years I&apos;ve often taken the boat out with friends. My work at PMM certainly has expanded my knowledge of trawlers, but I&apos;m a visual learner, so if I can actually see what a stuffing box or fuel filter does, I find it much easier to understand. Lauren, who designs all of PMM&apos;s editorial pages, doesn&apos;t have a boating background but has been aboard my family&apos;s boat a handful of times. Barb and I discussed how surprised we were that many new boat owners have no prior boating experience. That is what makes the Southwest Florida Yachts experience so valuable-it gives people who are thinking of purchasing a boat a chance to not only take an in-depth, hands-on course in boat handling, but also live on a boat and get a true feeling of what life aboard is like. It&apos;s important for every boat owner, for their safety as well as the safety of others, to gain some experience before taking the helm. Southwest Florida Yachts&apos; courses and charter opportunities are an appropriate and logical step in that direction. Barb explained that, as yacht brokers, she and Vic are realistic with their customers. If a potential buyer is looking for a certain type of boat or lifestyle, Barb says the SFY staff will make sure that client makes a purchase that is exactly right for them. In talking with the Hansens, I was truly impressed by their genuineness and by their dedication to their customers&apos; best interests-as well as to the interest of safe boating. After lunch, Barb told us that we would have a companion for the next few days, HankWise, who would also be taking the P-101 course. 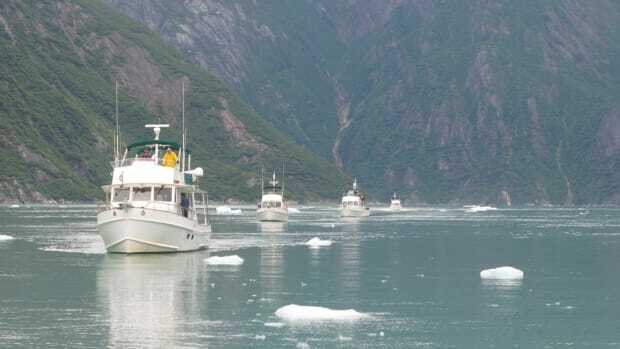 Lauren and I would be staying aboard Mar-Kat, a 42 Grand Banks Classic, and Hank would live aboard Blue Note, a 32-foot GB Classic that would be moored next to our boat. Eager for our time aboard to begin, Lauren and I retired to our berths after a long day of traveling, excited and curious about how our introduction to the cruising life would go. I awoke at 7:30 a.m. to a knock at our cabin door. "Doesn&apos;t our class start at 9?" I grunted to myself. (Have I mentioned I&apos;m not a morning person?) Half asleep, I opened the door and was greeted by our instructor for the course, Capt. Charlie Ryan. So that&apos;s what they mean by "oh-dark-thirty," I thought. Lesson one: most cruisers are morning people, so I&apos;d better get used to it. I headed to the marina bathroom to get ready for the day while Capt. Charlie got acquainted with the boat. I returned just in time to join Lauren and our classmate, Hank, for breakfast at a waterfront restaurant. A 69-year-old certified appraiser from Atlanta who describes himself as "working retired," Hank said his goal after retirement was to spend some time in New York City, San Francisco, and Chicago. He quickly realized his travels would be more of an adventure if done by water. And, after his wife passed away, the idea of cruising and living aboard became an appealing option. "I wanted to know if I liked the life and if I could handle the physical requirements," Hank said, explaining how he had arrived at Southwest Florida Yachts. Of course, living aboard would mean parting with his house and many of his possessions. But Hank pointed out: "I&apos;ve spent my whole life acquiring things and realized that when it&apos;s all said and done, that&apos;s all they are. Things." On the first day of P-101, half our time would be spent in the saloon, reviewing reference guides and workbooks and learning the rules and regulations of boating. The other half of the day, we would learn about the ship&apos;s systems and boat handling. There would be a test at the end of the course, so we made sure to pay close attention. Before getting further acquainted with Mar-Kat, we got to know each other a little better. Capt. Charlie told us about his background and how he had gotten into boating. He had served in the Navy for 28 years, acquired his 100-ton master&apos;s license, and started a yacht delivery company, teaching new owners about boat systems. Later, he began teaching powerboating classes like the ones at SFY, and now he commutes between his Fort Myers and Chesapeake City, Maryland, homes. Lauren, Hank, and I shared our boating experiences and then went straight to the books. When it came time for the hands-on learning, we started by descending into the engine room-one at a time with Capt. Charlie because of the close quarters- and getting the lay of the land. If I ever own a trawler, I thought, I&apos;ll make sure it has a roomier engine compartment than this one. Even though the Holy Place was hot and cramped, I smiled as I realized that what I learned here would really bring Steve D&apos;Antonio&apos;s stories to life. A lot of the systems looked and sounded familiar-fuel filters, sea strainers, and generators...oh, my! Capt. Charlie showed each of us the water pump impeller, the raw-water strainer, how to check oil and coolant levels, and a lot more. He was incredibly patient as he gave each of us the full tour and answered all of our questions, punctuated by the constant clicking of our cameras to capture the moment. "I&apos;m going to be a pro at this stuff," I said to myself as I crawled around the tiny engine room. After we had been introduced to our boat and her systems, Capt. Charlie had us take turns backing into an empty slip on the canal near the marina. Granted, I had done this on my family&apos;s cruiser, but never with a boat this large! The slips were narrow, and I knew this was going to be a challenge. Hank went first, and after a few tries and some guidance from Capt. Charlie, he backed Mar-Kat in. Charlie had us using only the shifters, not the wheel or the throttle. Port forward, stern back, both forward...after a while you became disoriented, and before you knew it, the boat was headed in the opposite direction. Next up was Lauren, who must have had beginner&apos;s luck, because she backed the 42-footer in like a charm with just a little direction from our captain. My turn was next, and my heart was pounding. There were fenders, sure, but I was afraid of knocking over a piling, or even worse, having to report back to PMM that I had crashed into the dock and that my boss would be receiving an invoice for the damage. I tried to reassure myself: I&apos;m really good at parallel parking, so this should be a breeze. Well, things are a lot more difficult when you&apos;re working backwards and you&apos;re on a boat! It&apos;s hard correlating which way to move the control to get the boat to move the way you want it to go. Charlie would tell me what to do, but since I was focusing so intently, the instructions only made it harder. Finally, I managed to back Mar-Kat in, only resting on the pilings one or two times. Phew! I would be fine with never trying that again. We finished up with lessons in line handling, using the VHF, and a review of the electrical panel. After a hard day&apos;s work, Hank drove Lauren and me to the grocery store so the three of us could provision for our class. As P-101 students, we were responsible for providing breakfast and lunch on board for ourselves and for our instructor. We picked up the essentials at the store, and after a nice dinner, Lauren and I found ourselves tuckered out from our day of learning. We stowed our food in the galley and studied a bit before retiring to our berths. The next day we covered classroom work, ship&apos;s systems, and more. We went over troubleshooting and radio calls, and then ventured up the Caloosahatchee River and anchored for lunch. Being out on the ICW, I finally got a feel for the laid-back cruising lifestyle. I could do this someday, I thought- marina hopping and cruising from one port to another. We learned how to operate the windlass, and we practiced side approaches at the fuel dock. All of us were feeling much more comfortable with the boat, and Capt. Charlie was very thorough in all of his teachings. After just a few days aboard, Mar-Kat was beginning to feel like home. As our last day of P-101 rolled around, Charlie decided he hadn&apos;t had enough of us and asked if we would join him and Hank for the rest of the week to take Inland Powerboat Cruising (P-102). This course, more focused on navigating, would take us out for a night at anchor and a night at a marina of our choice. The first destination that came to mind was Useppa Island, which we had featured in an article in our December 2007 issue. Having heard so many readers rave about the place, I was eager to see it. Plus, Useppa is near Sanibel and Captiva Islands, where I&apos;ve vacationed with my family for many years. Starting out for a cruise knowing we were headed for a destination was exciting. We felt like real cruisers. We plotted our course from Marinatown to Cayo Costa State Park, where we would anchor out. We headed down the ICW through "the miserable mile," a stretch of Gulf Intracoastal Waterway that runs generally east and west across the bottom of Pine Island. Lauren, Hank, and I each took a turn at the helm and had a chance to use the autopilot. The charting and navigating were new to all of us, so it was a great learning experience. Capt. Charlie said I was "confident at the helm." I&apos;m not sure I would have described myself in that way, but I was definitely feeling more self-assured about handling Mar-Kat. As we approached Sanibel, the water became clearer and clearer, and the gorgeous scenery even more breathtaking. We even had dolphins following under our bow-what a treat! We continued on toward Cayo Costa, anchoring on arrival and then working to lower the dinghy into the water, which was not an easy task. After a half hour of effort-followed by applause from our neighbors when we finally achieved success-Capt. Charlie dinghied us over to the beautiful little barrier island. Once on shore, we got a ride from a park ranger to a remote sandy beach on the other side of the island. We explored for a few hours and then waited for Capt. Charlie, who picked us up in the dink. For our first dinner at anchor, I made my famous Caribbean jerk chicken, and we had fresh asparagus and potato salad. Hank grilled hot dogs, too, but only one made it to the table-the others were accidentally fed to the fish. (One of the hazards of barbecuing off the stern, I suppose.) During the evening, some folks aboard a catamaran anchored nearby motored over in their dinghy just to say hello. Our time with them gave me a taste of the sense of community we talk about so often in PMM. Even out here in the middle of this quiet anchorage, it felt as though we truly were neighbors. Later, sitting on the flybridge enjoying a nightcap, I looked out and saw all of the other cruisers doing the same thing. As I drifted off, I couldn&apos;t help but wonder what their stories were, and how we had all been brought together here on this peaceful summer evening. We rose in the early morning, ready to cruise to Useppa Island. First, we practiced plotting a course with a chart and a hand-bearing compass and did some bookwork. We arrived at Useppa in the afternoon and made dinner reservations at the Collier Inn. As much as I enjoyed Mar-Kat, it was nice to take a shower in the marina bathrooms and get ready for a nice sit-down dinner. The very unique Collier Inn is perched on a hill, giving visitors a spectacular view of the sunset. As we dined and took in the scenery, the four of us joked that people must have thought Lauren and I were Hank and Charlie&apos;s trophy wives. We strolled back to our slip and got ready for bed, looking forward to a good night&apos;s rest before our last day aboard Mar-Kat. The next morning, as we motored back to SFY&apos;s North Fort Myers headquarters, I thought about what I had learned during the last week. Although there had been moments when the boat had seemed too small for the four of us, I was going to miss the cruising life. My experience with Southwest Florida Yachts had made it clear that anyone thinking of purchasing a boat or living aboard would benefit greatly from taking the classes that Lauren, Hank, and I had taken. With P-101 teaching you basic powerboating and P-102 letting you apply what you&apos;ve learned, it is a terrific combination. Nothing can compare to a living, breathing experience like the one we&apos;d had at SFY. These courses not only teach you about cruising and boat systems, but also can give you a good indication of whether the cruising life is for you. Hank said the boating classes had been very useful to him. But with so much uncertainty in the stock market and in the residential real estate market, he said he wasn&apos;t ready to make the leap to living aboard just yet. Until both markets recover, he will continue to live in his house and charter a yacht or book a cruise. We thanked our host, Barb Hansen, for an incredible week aboard, an experience we would never forget. As we made our way to the airport, I thought of something Hank had said on that first day that had really struck a chord with me. Something that, at 24 years old, I hadn&apos;t thought of before. So many people are focused on trying to acquire the latest and greatest, trying to outdo everyone else with material things. After you&apos;ve truly experienced life-at any age-you realize it isn&apos;t about things. It&apos;s about relationships, and living simply. And that&apos;s what the cruising life is all about. Southwest Florida Yachts provides many opportunities for sharpening nautical skills that are designed to appeal to boaters of all levels. SFY&apos;s Florida Sailing & Cruising School offers powerboathandling courses that range from three to eight days, vary from $1,295 to $3,495 per person, and combine bookwork with hands-on learning. Group classes are kept to a size of two to four students in order to provide a more intimate educational setting. The price of each course includes accommodations on board, expert instruction, fuel for the vessel, and course materials. Students can choose between courses aboard single- or twin-engine boats, and private instruction is offered for an additional fee. Southwest Florida Yachts has 15 power yachts available for charter, ranging from 28 to 43 feet, and the company is always looking to add new boats to the fleet. The current fleet includes Mainships, American Tugs, Grand Banks, Albins, and more. They also have sailboats for charter. If you are at all hesitant about the idea of buying a boat, the Southwest Florida Yachts experience-or something similar offered by another charter outfit-may be just what you need to help you decide if the cruising life is a good match for you. With so many services offered by SFY, you could charter with them and take a class, and if you liked both experiences, motor away in a yacht that you&apos;ve purchased from them. Talk about a package deal! SFY is featuring a variety of specials on classes and charters in celebration of its 25th anniversary this year. Visit www.flsailandcruiseschool.com or www.swfyachts.com for details.